WHEN WEIGHT MATTERS: Osprey Packs Ozone 22"
It’s not often I mistake a suitcase for shoes. But at only 4-pounds, 7-ounces the über-light Ozone 22-inch rollaboard had me fooled. At a glance, the delivery box waiting for me on the front porch looked to be about the right size for the new Osprey Packs carry-on I’d ordered for an upcoming trip to Europe. But once I picked up the box, I quickly changed my mind: guessing instead that it contained the new pair of hiking boots I was also expecting. Wrong. It’s tough to find a wheeled carry-on to fit clothes and shoes enough for extended travel that’s lightweight enough to schelp up staircases and into overhead compartments. But Osprey Packs’ Ozone 22”, one of the lightest fully featured rolling luggage on the market, looked up to the job. An 8-night luxury Mediterranean cruise. One week of active adventure in the Swiss Alps. A professional gathering and presentation in Lucerne, Switzerland. No matter how overstuffed I’d packed it, the Ozone stood easily on its own (thanks to a built-in stability bar) and wheeled equally well across airport concourses and cobbled streets. A capacity of 46-liters meant it was spacious enough to accommodate the varied wardrobe that such a diverse itinerary required. It was lightweight and portable enough for hefting on-and-off trains and up rail station staircases with quick-grab handles in all the right places. Once unpacked, the soft-top design collapsed into a compact form for easy storage when space was tight; beneath a ship’s bed, for example. Better still, the convenient rear panel pocket, zippered top pocket and vertical exterior pouches provided easy access to sunglasses, reading material, travel documents and comfortable shoes en route. If there’s one drawback to the Ozone it’s that unlike some rollaboards it leaves no room for expansion - something both my luggage and body are prone to when traveling. So, either you pack smart with room to spare or you carry a small duffle (like I do) for the overflow. The duffle can not only absorb trip extras but also a small daypack, with the added benefit of keeping you within the two carry-on limit. 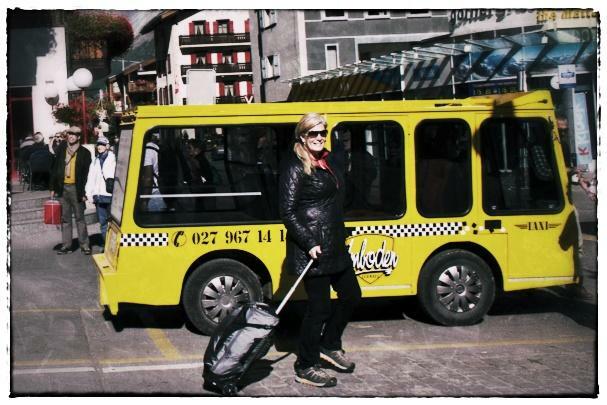 Toting the Ozone in Zermatt, Switzerland. Photo by Susan Kelly. Part of OSPREY PACKS wheeled luggage collection, the Ozone 22 is available for purchase at www.ospreypacks.com or at The Travel Store at EllenBarone.com Available in light grey or green. Suggested retail price; $299.